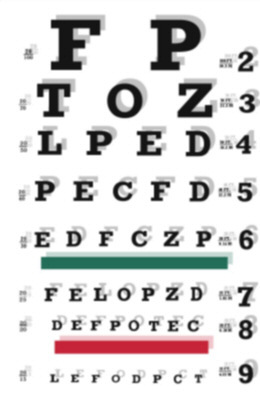 LASIK surgery is promoted based on visual acuity, that is, how well a patient can read the Snellen eye chart. Like the general public, prospective LASIK patients believe that 20/20 means crisp, clear vision. LASIK surgeons are happy to discuss LASIK outcomes in terms of how many patients achieve 20/20 vision without glasses. But LASIK surgeons don't want to talk about how 20/20 vision may be a waking nightmare after LASIK. FDA-required clinical trials demonstrate that LASIK reduces "quality of vision", even with the latest FDA-approved technology. Consider the bottom four charts below. Except for the bottom right chart, all are 20/20. 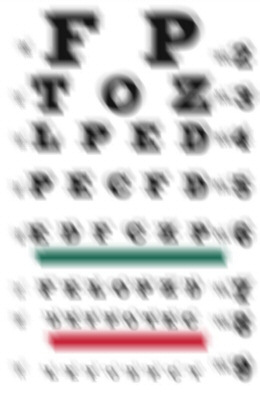 Many LASIK patients have "quality of vision" this poor or worse, yet are told by their surgeons that their surgery is a success. The 20/20 line is just above the red line on the charts below. In all but the last example, the 20/20 line can be read. 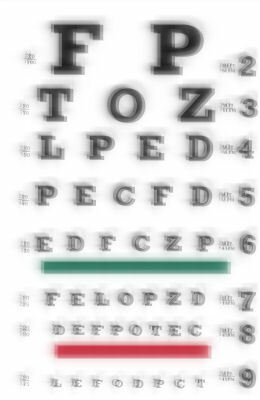 If you have an outcome similar to these after LASIK, your surgeon may deny that anything is wrong with your vision because you are 20/20. If you sue the surgeon, the surgeon's legal defense team will tell the jury that you are 20/20 and deny that you suffered any damages. In fact, you may not even be able to find an attorney to take your case. The LASIK industry knows this and capitalizes on it.